Our Thermage CPT from the Solta Medical portfolio of leading brands is a groundbreaking skin tightening and body rejuvenation device. Thermage CPT units are powered by non-invasive, monopolar radiofrequency. The therapeutic platform is entirely different from laser-based systems on the anti-aging market. A refurbished Thermage CPT provides patients with both immediate and long-term benefits. The Thermage process uses radiofrequency to deliver heat; heat shortens skin collagen fibers, causing them to contract. The skin quickly, visibly tightens. Radiofrequency treatments with a used Thermage CPT also stimulate fresh collagen production, which significantly prolongs the effectiveness of the procedure. Our refurbished system features Comfort Pulse Technology or CPT. It is an upgrade over prior Thermage units. Physicians consider CPT a more accurate, more powerful treatment delivery system and patients report less discomfort during and following their procedures. Drooping eyelids, baggy eyes and double chins. 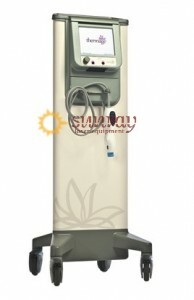 SunrayLaser.com proudly offers an array of aesthetic medical devices from the Solta Medical portfolio. The Thermage CPT ranks among our most popular units. Physicians report that patients request Thermage treatment by name, thanks to testimonials to the technology in high-profile media. SunrayLaser.com guarantees that every refurbished Thermage CPT we sell will perform to the standards specified by the equipment manufacturer. We back every sale with a promise of complete customer satisfaction. To add the power of Thermage CPT to your practice, please contact us via the form below. We will be in touch quickly. The low price we are able to quote for a used Thermage CPT will surely make you- and your patients- happy.